The ugly hybrid cars of 2018 have put us in need of some nostalgia; how about a 1000bhp, turbocharged V6 with a manual gearbox? 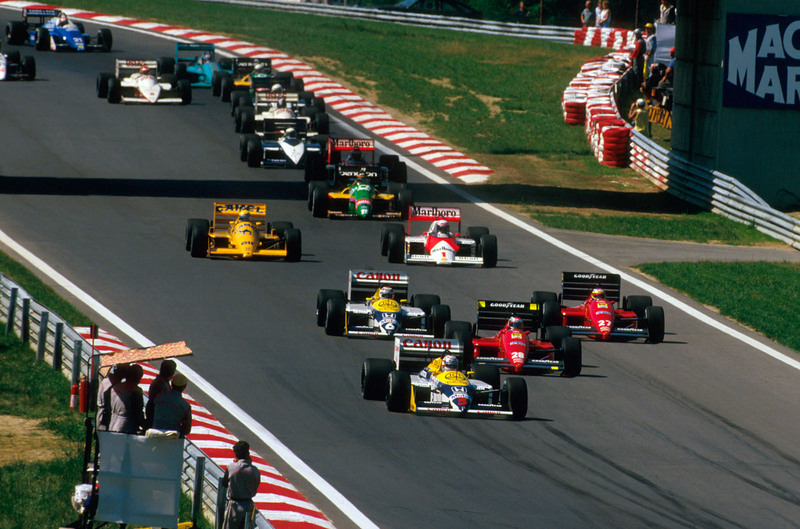 Many people see the 1980s as a golden era of Formula 1. Those people are correct. 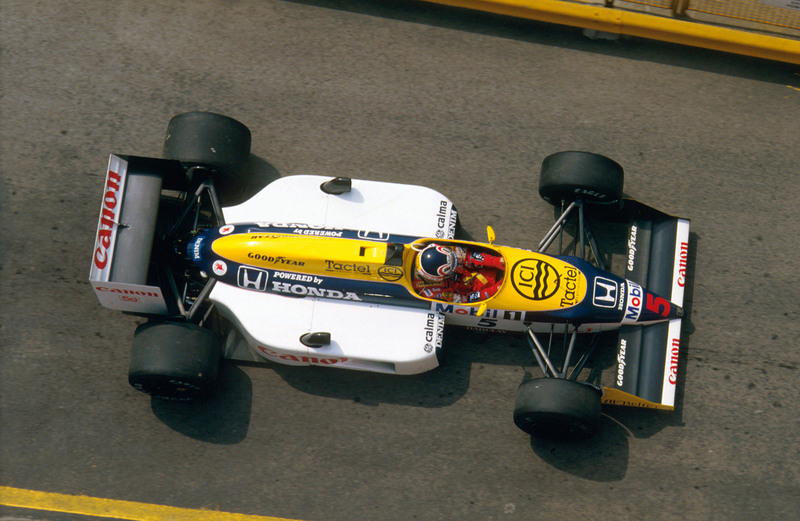 Holding a special place in many fans' hearts are the turbocharged 'monsters', and the Williams-Honda FW11 is a fine example of them. This handsome British chassis took the constructors' championship in 1986 and, in 'B' spec, both titles in 1987, following nine victories in a season of sparring between a Nigel Mansell at the peak of his powers and the mercurial reigning world champion, Nelson Piquet. Indeed, when grand prix race winner John Watson drove the FW11B for Autocar at Japan's classic Suzuka circuit on 7 December 1987, he did so with the objective of "reaching some sort of conclusion about what it takes to create a winning car" – one he described as having been "head and shoulders above the rest of the field". 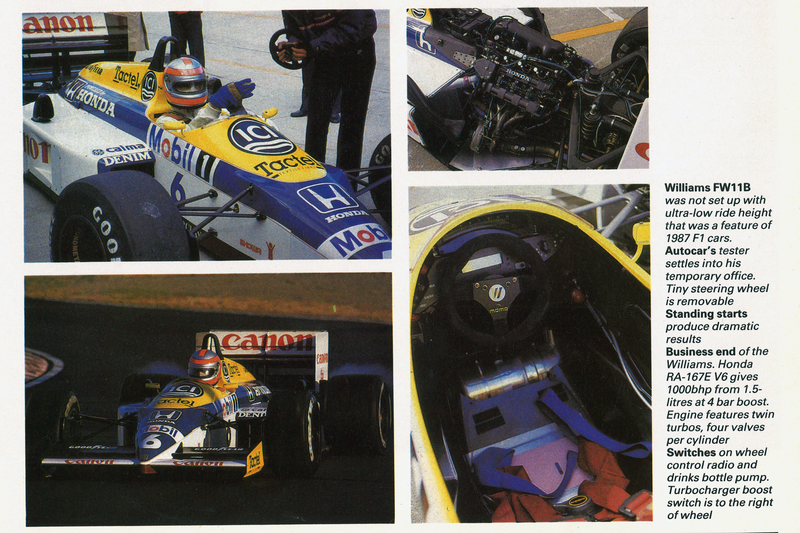 Much of the FW11B's prowess was down to Honda's excellent RA167-E engine. This 1.5-litre V6 had two turbochargers and a redline of above 12,000rpm, allowing it to peak at circa 1000bhp (this was for qualifying; it was downtuned to 800bhp for race distances). In a car weighing a mere 540kg, this afforded a 0-60mph time of 2.6sec and a 0-160mph time of 10sec; all in a car with a six-speed manual gearbox and rack-and-pinion steering. Brave stuff. Fortunately, Northern Irishman Watson was an experienced racer, who had made his Formula 1 debut in 1973, came close to winning the title for McLaren (he was third in the 1982 drivers' championship) and contested his final race in 1985. He began: "I had half expected it would be a case of light the blue touch paper and stand back. Once the engine had been warmed up and I had dealt with the very heavy, abrupt-acting clutch, the world championship-winning Formula 1 car had purred onto the track without a sign of reticence. 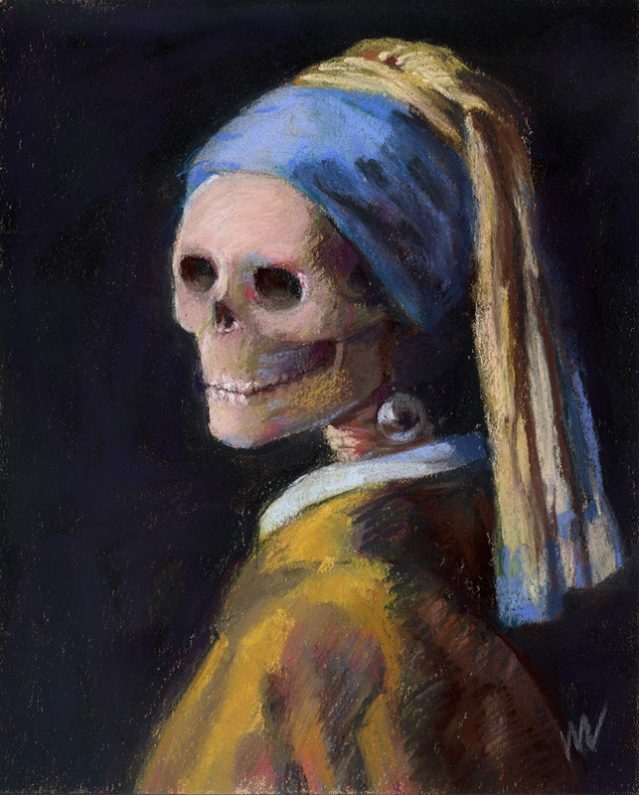 It was almost docile. But now, back in the pits, the Honda engineer was turning up to the boost – from a getting-to-know-you 3bar to a grand prix-winning 4bar. A small jump, you may think, but in a car now capable of 200mph, a change guaranteed to cause fireworks. Or so I thought..."
Before he proceeded around the circuit, Watson had a caveat, in that he was "unable to make himself completely comfortable in the seemingly miniscule cockpit". "With the sort of cornering, accelerating and braking forces a present-day F1 car is capable of generating," he said, "it is vitally important for the driver to feel at one to get the most out of it. "That is really only possible with a tailor-made seat and all the essential controls set up exactly to suit his frame. In this case, my knees were too high up behind the instrument panel and the gear lever in the first-second plane was hitting my thigh. Being tall compared with today's grand prix drivers, I was also sitting an inch or two too high". He also pointed out that he did not know the track, car or engine, and that there were no tyre blankets available on the cold December day. But, to quote Watson, "that's enough of the standard racing driver's excuses...". Inside the carbonfibre-monocoque-based FW11B, there was a quickly detachable steering wheel and pedals positioned "very closely together, due to the narrowness of the footbox", allowing the driver to "depress the clutch at the same time as rolling your foot onto the throttle pedal for downchanges". The layout was simple. As Watson described it: "On the spokes of the tiny, 10in steering wheel are two button switches, which control car-to-pits radio and the electric pump for the drinks bottle. Directly in front of you, there's a digital boost guage and rev counter, which activates at 7000rpm. "Below those two readouts, again displayed in LED form, are oil temperature, water temperature and air intake temperature. On a seperate panel on the left-hand side, there's a fire button, which isn't easily accessible, the tail-light switch an the main ignition switch. There's no fuel pump switch. Behind that is the knob controlling the brake balance, which, judging by its inconvenient position, isn't something that is adjusted often. "On the panel to the right is the turbocharger boost switch. The amount of boost is dictated by fuel consumption and varies from circuit to circuit. It's rather pleasing, though, to know that if you need an extra spurt of power, all you've got to do is reach down with your right hand and click the switch up a notch." Watson continued: "The short gear lever is not the slickest I've ever used. Specifically, in the first-second gear plane, the lever has to work against a fairly strong spring forcing it towards the driver, while the second-to-third change goes from a heavily sprung gate into an almost unsprung one. It's not a naturally comfortable gearchange." Of the car's V6, however, he had no complaints: "Honda has made terrific strides with the engine. When it re-entered F1 [with the Spirit team in 1983], the engine was based on motorcycle thinking, which called for a large bore, short stroke and the ability to rev high, the thinking being that power was the key to success. "As the team has learned, however, power is not the sole key to success. There's no point having 1000bhp if it's only available in a 1000rpm rev band. The Honda engine in the back of the 1984 Williams FW09 was very powerful but rather like a switch – either on or off – making the car very difficult to drive. By the middle of 1985, Honda engineers had produced an engine that was far more driveable. "It was shown during the 1987 season that Honda had a better grasp of engine technology than anybody else. 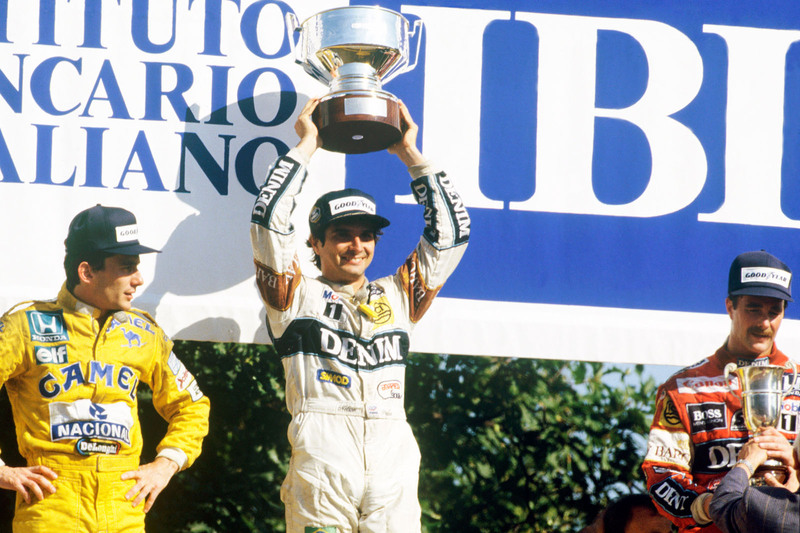 The cars were able to run more quickly in race trim for less fuel than their rivals – an impressive achievement. "There are many aspects of it that differ in philosophy from other competition turbo engines. During my exploratory lap, I was amazed at its remarkable tractability. There didn't seem to be one area in the power curve where a flat spot was detectable. In fact, it's only when you get above 7000rpm and the boost pressure beings to build – and at that point, it starts to build very quickly – that you actually become aware of how much power you've got under your right foot." After a few more laps, Watson remarked: "Once over my initial surprise at the engine's power delivery, I was able to settle down and assess a little more of what was happening around me. "I had already decided that I didn't particularly like the dinky steering wheel, which felt very much like what you'd get on a go-kart. The steering itself is light but with quite sharp kickback if you happen to touch a kerb. The physical effort in steering the FW11B is actually quite low and would therefore make it less stressful to drive than some other Formula 1 cars I've experienced. "The braking system, which employs cast iron rather than carbonfibre discs, nevertheless provided really reassuring performance It was undoubtedly aided by that barn door of a rear wing, for as soon as you lift off the throttle, it feels as though someone has stuck out a giant hand and stopped the car. While such a set-up may be fine for providing a little extra margin for those unfamiliar with the car, it's creating far too much drag for a racing situation. "The throttle pedal is surprisingly short in its movement, and initially I was worried about not being able to modulate it precisely enough when full power was coming in. Once again, my worries were ill-founded. "Ride quality is not too bad, and therefore the obvious question is asked; no, the test car was not set up to the latest belly-banging ride height that produces a shower of sparks from the titanium skid pads. Such an arrangement worsens ride quality, but it also increases the amount of chassis downforce – as opposed to wing downforce – that is available. "In terms of feel, the FW11B is quite forgiving and therefore relatively easy to drive. Like with any racing car, though, getting the best out of it on the limit is difficult, even though it appears to retain its poise and controllability in such circumstances. "One of the biggest problems is in slow-speed corners, for although power delivery is very smooth, at around 8500-9000rpm, when it really starts to chime in, it's very easy to break traction by being too enthusiastic with the throttle. The technique is just to get through the corner and then, as quickly as you can, pick up third and fourth gears while keeping wheelspin to a minimum. "There's no doubt that the potential of the chassis is very high, but you have to work for it. You don't just step into the car and it automatically happens for you; it comes through familiarisation." 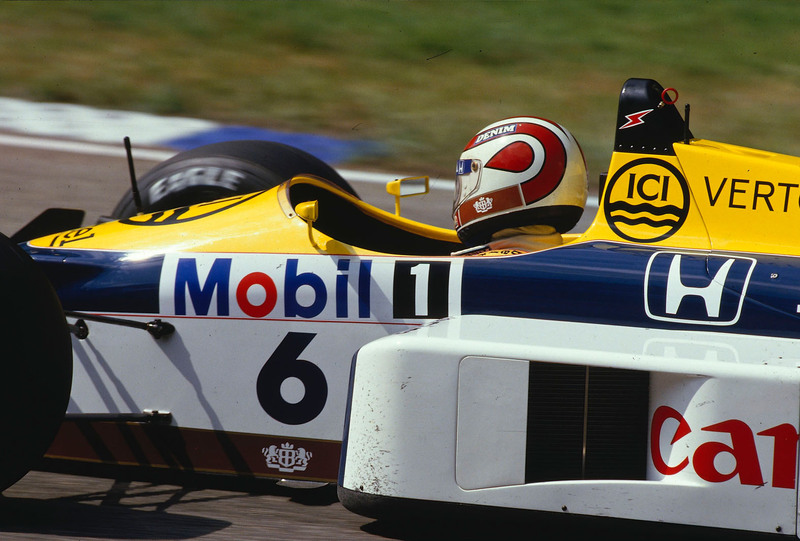 To answer his opening mission statement, of why the FW11B was so successful, Watson concluded with this: "Like all winning cars, it's not good for any specific reason; its success is due to the total package. "Clearly, there has been a tremendous amount of work done by both Williams and Honda to make the chassis and engine marriage a successful one. But something of a myth has developed around the engine because of the results Williams has had with it. I feel that the team's success is, in very large part, due to the engine, but what Williams has done is make use of it in such a way that the harmonising of the two aspects, engine and chassis, has produced an unbeatable combination. There is no doubt that the Honda engine is outstanding, but it needs to be part of an equally outstanding package if it's to shine." Over 2 seconds slower than a Tesla Model S to 100mph... but I think I know which one I'd prefer to have a go in. There must be a mistake in the performance figures. With so much power in such a light car, together with good enough traction before the downforce builds up, to get it to 60mph in 2.6 seconds, there is no way it needs as long as 10 seconds to get to 100mph. Sorry, that should have said 160mph, not 100mph. I'm amazed any of you seriously thought it took 10 seconds to reach 100mph?